Leah and I have been on the road almost three months and the cravings are starting. It’s always what you least expect, I’d cross Patagonia for jar of peanut butter.. ok back on topic. Panada Express Orange Chicken. Miss it, dearly. Can’t say I frequented Panda Express too much at home, but when I did, it was enjoyable. This recipe can easily be molded to pretty much any of the chinese buffet chickens, Orange, Genral Tsao’s, Sesame, Garlic, and so on. Just need to substitute the flavor in you want. 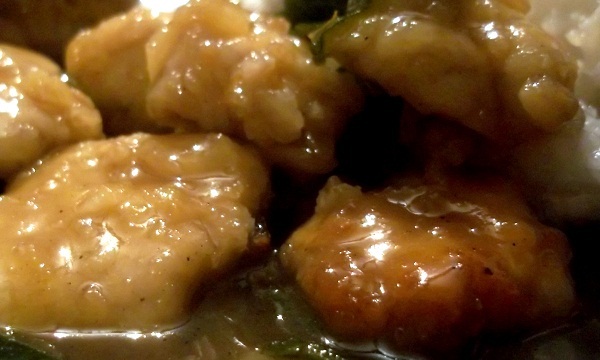 This recipe isn’t as easy in a hostel as some of the other recipes, but if you run across a nice kitchen and have a craving for orange chicken, this is your ticket! Enjoy! Mix together ingredients for sauce in bowl, set aside. Place chopped green onion and garlic next to stove. Once the chicken is fried, this recipe moves fast. You’ll want all ingredients next to the stove. Break 2 eggs into large bowl, stir in dash of salt and pepper. Drop chicken pieces in large with eggs to coat. 4 or 5 pieces at time drop chicken into bag of flour. Shake bag to coat chicken in flour. Place coated chicken on plate. Continue steps 5 and 6 until all chicken is coated. Pour oil into pan and heat over medium-high heat. Fry all chicken, 4-5 pieces at a time. Place fried chicken pieces on plate. Fry garlic for 15 seconds until you can smell it. Add green onions. Fry for 30 seconds. Add sauce. Bring to a boil. Boil for 1 minute. Add 2 table spoons of flour and stir into liquid. Add chicken pieces to pan and stir. Fry for an additional 2-3 minutes to blend all the flavors together. As the sauce thickens. If sauce isn’t thickening stir in another tablespoon of flour. Not as easy as the other recipes on this website, but if you are craving some orange chicken, this will be a live-saver. Enjoy! Let us know your thoughts!